It’s Friday, it’s so very pleasant outside, and I refuse to skip my meeting with God while sipping coffee on the back deck. However, it’s Friday. So I must gulp, rather than sip, and my mind must be focused and sharp to hear His voice in this short space. The boy will be up early and will drive me to town. He will power-up via his bi-weekly workout with friends, generously giving me an hour to sit in the parking lot before he drives me back home. This sunny morning, I decide to dress for walking while the boy works out. As he drives toward the park, I hear the noise of traffic; cars, all shapes and colors, and trucks hauling supplies and equipment, all combining for such a lovely noise. I am spoiled. I crave the quiet clamor of animals and nature over roaring vehicles, and decide on a country road walk later in the day… if the heat does not become too forceful. So what do I do with this hour of mine? I’ve brought my Spanish homework – it sits in the back seat – but I prefer to study where I can spread things out on the expansive counter island or a comfy bed, with access to SpanishDict – extremely helpful in correcting and guiding the learning of a foreign language. Next to this pile of books lies my Complete Jewish Bible. (My husband once commented that it was good that I got the “complete” version… 😳.) What called to me though, was the blue-covered iPad. For earlier, as I was dwelling with the Lord, and pondering that I had not written in awhile, excuses rolled through my head about how busy I was and that there was nothing of interest to write about. The Voice, however, spoke otherwise. “The words are within, but it is up to you to make time for them.” I LOVE that about God! He is always there; so patient, so kind and loving, waiting for us to seek Him and willing to speak if we will listen. My mother has the gift. She and I are opposites – she says her teachers described her as the “dreaming” kind, easily lost in her thoughts and daydreams. Because of this, writing comes fairly easily as she enjoys and entertains her creative side. Taking time to write comes fairly naturally for her. I have always been a “do-er”. This must get done, and that must be done, something must be learned and there is somewhere to go. I rarely can sit through a TV show, and if someone wants me to watch a movie with them, they better take me to the theater if they prefer I don’t get up every 15 minutes to accomplish something. It is difficult for me to sit and write as I feel the pull of other things impatiently waiting for my attention. If you see yourself relating more to one style than the other, do not stress or worry, it is simply who you are. Neither is wrong or right; both are gifts. When the Voice spoke, I was thankful for it. The Word spoken is true. Time being short, I headed for a quick shower, instantly being reminded that I’d only cleaned half of it the day before. There would not be time this morning to clean the other half. It really needs cleaned. Actually, it needs a remodel. A cleaning will have to do for now. But not now. Later. I hate cleaning the shower. What else do I hate? Cleaning the stove. It is such a tedious job. It’s not a nice smooth electric glass-top, but rather a grate-topped propane stove. Cumbersome to clean. I could go into further detail about the annoying little parts, but I’m sure you get the idea. Why is cleaning such a chore? 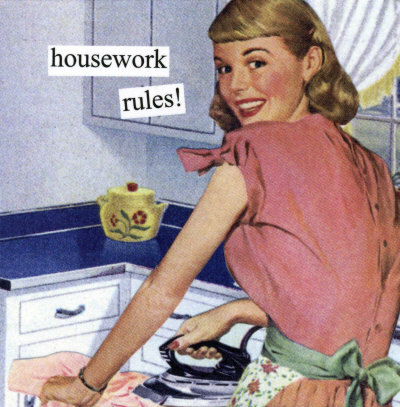 I certainly enjoy a clean house. I don’t mind cleaning up after myself… maybe that’s it – I don’t enjoy cleaning up after others! Doesn’t seem like a big problem, just teach the kids to clean up after themselves, and together, everything stays in order. Easy peasy. Unless… you have boys. Yes, this may be a little stereotypical, but generally, males are more likely to just not see the mess or understand the fuss. I have eagle eyes and can see every… little… speck. Just ask my husband or sons. With debris scattered everywhere (from my point of view), I ask the culprit(s) to clean up the area. A short time later, when asking why the task was not done, I am met with a quizzical look and a retorting “I did clean up!” My eagle eyes zone in on anything and everything remaining, while the tunnel-vision of the male focuses on the one clutter-free spot. Poems and short stories written by my Great Aunt Peggy left behind wisdom for those blessed and willing to read them. I remember one in-particular: Dishes To Do. She lamented that there were always dishes to do, especially after having family over for various occasions, or to just share a meal, and how she was discouraged over all those dishes left to do. But the day was to come, and did come so soon, when there were no longer dishes to do. Children and grandchildren, brothers and sisters, nieces and nephews, all grow up into lives of there own and come around less often. There were certainly fewer dishes to do, but there was also an increase of times without the company of those loved-ones whom the dishes were dirtied for. A good reminder to live in the moment and enjoy the company of others versus having a clean and orderly house. So how is one to train oneself to enjoy cleaning? Is that even possible? How about thinking of those for whom you are cleaning, remembering the enjoyable times of relating and life-sharing moments, tears and laughter that brought about the chaos, and giving grace to those growing children or grandchildren that one day will come around less frequently. I also think back to when I was a child, sitting on the floor behind the 1970s black padded stereo bar listening to Carol Channing, black disk spinning on the record player. She too had good advice. Take a three minute listen.